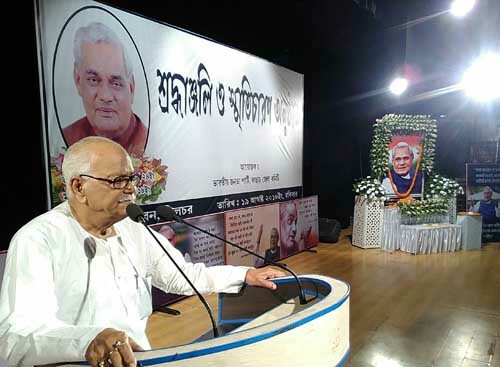 Along with rest of the country, Cachar District of Assam’s Bharatiya Janata Party (BJP), paid tributes and homage to former Prime Minister of India, Late Atal Bihari Vajpayee, at Silchar’s Bhanga Bhavan on Sunday. A condolence meeting was also held wherein speakers from all walks of life gathered to pay their obituaries for Vajpayee. The Maharaja of Gwalior agreed and rest as they say is history, informed Kabindra Purkaysatha. Rich tributes and homage were also paid by minister of forest, excise and fisheries Parimal Sukhlabaidya, MLA from Silchar, Dilip Kumar Paul, MLA from Sonai, Aminul Haque Laskar, MLA from Udharbond, Mihir Kanti Shome, President, District Sports Association, Babul Hore, among a long list of senior citizens and intellectuals that had gathered at Silchar’s Banga Bhavan to pay their last homage and floral tribute to Atal Bihari Vajpayee.